I have put together a few things that may help you keep your child on the right side of stress. Remember: Supplements should be used under the supervision of a licensed practitioner familiar with the specific supplement and its use. Don’t have one? 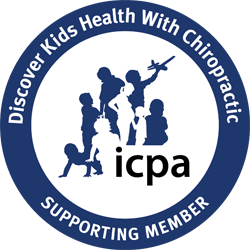 Find a chiropractor in your area who sees kids at the ICPA website. Let’s start with the basics. Why is your child responding differently? How is your child responding differently? Are they highly active; can’t calm down and can’t think? Or are they clumsy, and easily frustrated? Do they overreact to things in their diet? Do they have seemingly random out bursts? These are all signs that your child is having a hard time adapting to their environment. Figuring out the root cause is going to take you a lot farther then trying to treat the myriad of symptoms. So how do you do that? Asking a pediatric chiropractor is a great start. They are trained to see your child as the wonderful self-healing, self-sustaining being that they are, even though right now they are maladapted. And the ADAPT part of maladapted is really the key here. They can’t adapt to the change in their surroundings and so they become reactive instead; always reacting, never adapting. We’re starting with the most difficult step first. It’s time to remove the artificial dyes, gluten, and dairy. These are the worst three culprits when it comes to inflammatory load, and when your body is constantly inflamed it needs to work that much harder just to function. But Dr. Sarah, I have a picky eater. I’ve got you, momma! Whether it’s with food, juicing, or supplements, where there’s a kid, there’s a way. I haven’t found a child yet that I couldn’t find a way to get them nutrition they needed. If your kid despises all things green and leafy, then let’s hide it. If your kid only eats pizza and mac and cheese, make swaps for healthy non-gluten items. When your child is deficient in nutrients and you ask them to deal with stress they just burn through what little they have, then what? It’s like running a sports car on regular low-octane gasoline- sure you can make it go, but it won’t work nearly as well as if you filled that same car with better quality high-octane fuel. You lose a great deal of potential. If you’re looking for place to start with menu ideas, The Wellness Mama blog is a great resource for recipes and even has and a meal planning app to help make meal time easier for everyone, parent and child alike. GABA, valerian, chamomile, bacopa, theoinine, zinc, iodine, and other over-the counter supplements work with your child’s brain chemistry to help calm an over-stimulated nervous system. However, there’s no one magic pill that can make everything better overnight. Supplementation for children is especially tricky because of the complex genetics involved in neurotransmitter cycling. No practitioner, MD, DC, ND can say for certain that they know how your kid will react to any given supplement. It takes a lot of time and expertise, and a little bit of trial and error to find the right combination for each individual. Diet change, supplementation support and lifestyle change ALL must come together in the right way for each child, and figuring that out takes time. Thankfully, your ICPA chiropractor is trained to walk you through it all and get you the support you need through their individualized care, and with Pathways Connect groups. Some of my favorite things are seeing the changes that meditation can bring to a whole family. In my house, we have everyone stop what they’re doing, come sit on the floor, and we all listen to a guided meditation. Honestly, it’s probably not going to go smoothly the first time and that is ok. Changes in habits take time and dedication. I also know it can feel like you only have so much bandwidth to do things, and it’s never enough. But meditation has been shown to improve heart rate, lower stress hormones, and improve immune response. There are lots of free apps out there to get you started. My favorite is ___, but don’t be afraid to keep trying different apps until you find one that works for you. This a long, fancy name for a heart monitor you hook up to your iPhone with the goal to decrease stress. It measures your heart rate and guides you in a breathing exercise to increase your heart rate variability. The more variability in your heart rate, the better you are dealing with stress. You can buy a StressEraser and hook it up to your phone to use with the StressEraser app, or the app also has guided breathing that you can perform without a heart rate monitor. As little as 5 minutes of heart rate training a day for 8 weeks has shown significant stress reduction and sleep improvement. It’s also easy to turn it into a game to better engage your child and turn it into something fun! Spend time outside running around! Some kids react great to burning off excess neurotransmitters, some get wound up. Be aware of time of day and how intense the activity is and adjust your play time to conditions that work best for your individual child. It’s important they have unstructured time, too. I know we mean well, but sometimes as parents we are so concerned about making sure our child has the best opportunities in life that we forget to just let them be a kid. I see some young patients in my office that are in PT/OT 5-6 days a week. That would be tough on a full-grown adult! Busy schedules without socialization or down time can make the child feel isolated, and that can just lead to more stress. Socializing is a huge part of stress reduction, so have dinner together, take a family walk in the evenings, and give your kids time to learn to engage others socially one on one. These 6 steps are a good starting point for helping your high-anxiety child actually look forward to the Fourth of July, instead of dread it. For a deeper approach, I have found customized care protocols based on genetics and lab testing to be very useful in helping over-stimulated children in my practice. If you’d like more information on how the chiropractic approach can help your child, give us a call at 888.476.5171, or email info@drsarahwatson.com.